Colorado Emergency Management: Larimer County connects more than 600 properties this week for vehicle access! Larimer County connects more than 600 properties this week for vehicle access! Information from Larimer County Community Information Manager. Larimer County’s Engineering Department has released an updated Larimer County Flood 2013 Transportation Bulletin showing progress to date on road corridors countywide. Larimer County has connected more than 600 properties this week for vehicular access. Vehicular access has been restored to both Storm Mountain and Crystal Mountain in unincorporated Larimer County through the construction of pioneer roads in the wake of the devastating floods. Pioneer roads are rough, temporary roads. 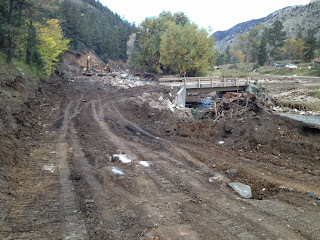 Work on a pioneer road from Drake towards Glen Haven on CR 43 (Devil's Gulch Road) has reached the Storm Mountain Road. Residents can access the Cedar Park / Cedar Springs subdivisions on Storm Mountain utilizing US 34 from Estes Park to Drake. Access is for residents only (credentials required) and is only allowed on Sunday from noon until 5 pm. Access to Crystal Mountain off of Buckhorn Canyon (CR 44H) has also been restored via Pingree Park and Pennock Pass. Work on the pioneer road in the canyon continues from both ends. Information is detailed in the weekly Transportation Bulletin available at the County’s flood page on the Virtual Courthouse for complete details: http://www.larimer.org/flooding2013/. Citizens are encouraged to subscribe to the web site to receive information automatically as it is published.